You refresh your Instagram feed when you're in need of some fresh outfit inspiration—why not let it help guide your summer shopping too? The good weather has all of your favorite style stars out and about, 'gramming their outfits along the way, which means we're constantly coming across (and double-tapping) new trends for our "to try" list. Among them are belted swimsuits, smocked tops, silky midi skirts…all delightfully summery pieces that make for some good #OOTDs. So if you're looking to update your seasonal wardrobe, turn to your Internet friends for some tips on the best pieces to shop for right now—they know what they're doing. Ahead, six options to get the ball rolling. It wouldn't be a summer trends roundup without one swim style that's ever-present—and for 2018, that's the belted suit. As seen on Instagram favorites like model Paloma Elsesser, a well-accessorized one-piece or bikini serves a whole lot of look on the sandbar, so get ready to see even more of it as people take off on Summer Fridays. A LWD is a solid summer staple not only because it's easy-breezy, but also because it's a sort of blank canvas that you can embellish to your heart's desire with bright accessories. And one with rounded shoulders—like this one worn by Sincerely Tommy's Kai Avent-deLeon (which, alas, has sold out)—adds a little extra drama to your seasonal wardrobe. A few years ago, it may have been unfathomable that you'd want to wear anything other than short shorts during the summer months—but oh, how things have changed: Not only have the inseams gotten longer, but there are plenty of incredibly stylish alternatives. The frontrunner for most Instagrammed is Réalisation Par's sold-out midi skirt, as seen on style stars like AnneLaure Mais—luckily, there are plenty of silky alternatives on the market that'll allow you to achieve the look. The extra effort to strap these on is worth it: The season's best footwear is a tad more involved than your slides, but these sandals make a big statement with little embellishment. 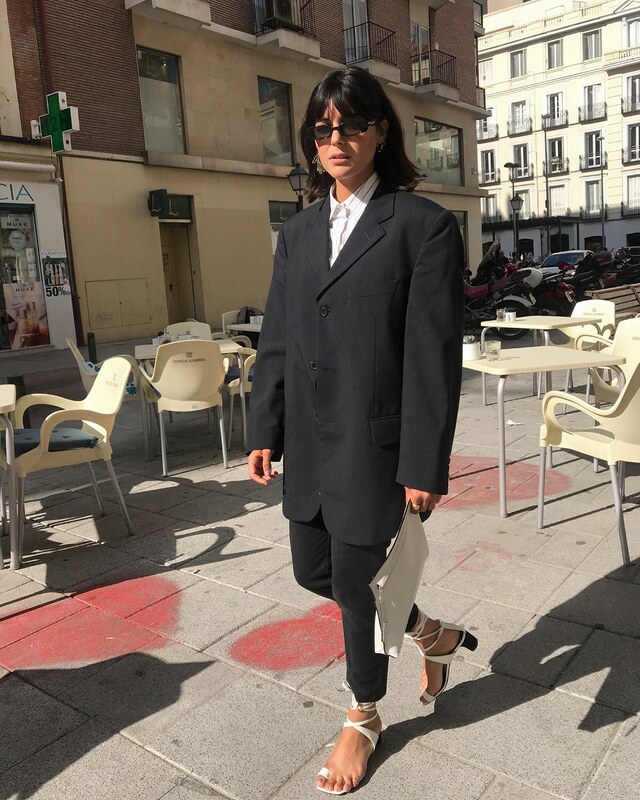 Exhibit A: Even when styled with an oversize suit, Maria Bernard's toe-loop shoes stand out. The '90s called, and they're here for the comeback of the smocked top—are you? It's a trend that's already been endorsed by model Ali Tate Cutler and plenty of fashion brands for summer, so you might as well get on the nostalgia train now. Swap your spring gingham dresses for summer checked trousers, à la Alyssa Coscarelli. They're the perfect companion to your white T-shirts, light button-downs, and yes, smocked tops.